July has been marginally better than June for cooking/baking new recipes. I seem to have lost motivation for trying new recipes, I still enjoyed looking at lots of lovely cookbooks and ideas, but then revert to the quick and easy family favourites. Seeing as I had a s surplus of lemons I made these Lemon Snowflake Cookies, from a recipe I pinned a while ago to my Delicious Board on Pinterest. They suggest using a small ice cream scoop of dough per cookie, I used a heaped soup spoon. Verdict: Mine didn't seem to spread as much as the ones pictured in the recipe, but they were delicious, tangy and chewy and very edible. Leanne (QuiltmeKiwi) was coming to visit me, and deliver my sister's Bird Dance Quilt. As a long time reader and commenter on my baking related posts, I thought I had better try a new recipe out on her. I made Danish Dream Cake from Phillipa's Home Baking, a new book I got out of the library. This is a light sponge type cake with a caramel coconut topping, relatively easy to make with ingredients I had in the pantry. Verdict: We all enjoyed this, Miss B couldn't get over how light the cake was. Sugar-crusted rhubarb and apple pies were calling my name. Verdict: Absolutely scrumptious, they weren't too fiddly to make, and will definitely become a favourite rhubarb recipe in my collection. Here's to August, the last month of winter for us, hopefully I will be more inspired to cook and bake. and some shades of grey. Yep, I'm still making Ice Cream Soda blocks, this batch takes my finished tally to fourteen. I seem to be having some trouble getting the centre of the inner star to meet nicely and as neatly as I would like, I think using the Liberty makes it better, due to the finer fabric. I don't really think it is bad enough to unpick them and as my grandpa used to say " a blind man would be pleased to see it". The kites and crowns in these blocks have also been glue basted , still not sure if I'm a convert , but definitely quicker than thread basting. I have another two blocks prepped and ready to sew up. My mystery hiking destination was Rangitoto Island. The Scout planned very well, it is somewhere I have wanted to explore for a while. Rangitoto Island is situated off the coast of Auckland, and is an iconic landmark of the city. It is a relatively young volcano, erupting about 600 years ago. It rises 259m over the gulf and is 5.5km wide. The crater is 60m deep and 200 m wide and is now fully covered in regenerated forest. It is totally pest free, and there are a number of traps located around the island to ensure it stays that way. It was used as an observation post during World War II, and there are a few look out points left from then. There is no public accommodation on the island, however , we stayed in the old scout bach, which was powerless, so ate and crafted by candle and torchlight. There are a few other old baches on the island dating from pre World War I era. I woke early on Sunday morning, so was able to enjoy a beautiful sunrise feeling like I was the only person on the island. The hike to the summit takes about an hour, and is not excessively strenuous, I enjoyed seeing the different mosses, lichens, and bird life, including these friendly wax eyes that would take raisins from our hands at the summit. The views out over the Hauraki Gulf were stunning. We took a different track back down so we avoided all the tourists, and saw lots of black scoria outcrops, you could just imagine all the lava running and cooling on here as it was erupting. I'm back home now, refreshed after a weekend away, a few tired and sore muscles, ready fo the back to school and work rush tomorrow. Ten Ice Cream Soda Blocks .. Doesn't that post title make you want to start singing? The July/August packs of Ice Cream Soda Quilt pieces arrived in the mail the other day. All eight blocks for May have been completed, and as I started the eight for June, I thought I'd do a group photo. The completed blocks are definitely an eclectic bright scrappy mix of colours and fabrics. I have decided I am definitely lacking some blue blocks, and have managed to cobble together some fabrics for one block, whilst realising, that while I have a lot of aqua in the stash, other blues don't feature as heavily. Luckily I know that my Liberty scraps have some blue pieces that should mix with some other fabrics. The Scout is taking me away hiking this weekend, the destination is a surprise, the weather is rather wet and cold, so I have prepared a couple of blocks to work on in the hut, if we get rained in. Also, if anyone would like to see my sister's beautiful Bird Dance quilt - check out Quiltmekiwi's blog post about the quilting of it. Both Janine and Leanne have made an amazing job of this. Hope you all have a fabulous weekend - whatever you end up doing. Now that my Bird Dance project is pretty much completed, and while I am procrastinating over choosing felt colours for my next applique project, I thought I would do some work on the Open Wide! pouch I am making for my sister. I bought the pattern, mesh and soft and stable while I was over in Brisbane visiting her. She chose her favourite Kaffe Fassett fabric for the exterior, which we paired up with a beautiful coral toned shot cotton for the lining. The exterior has been quilted and edged, it was the first time I have used soft and stable before, and I have just attached binding to the mesh which will be used for large pockets on the interior. We decided to omit the contrast trim on the exterior, so we didn't lose any of those divine florals or colours in the Kaffe fabric. Next up is the zipper installation. Once this pouch is completed it will be sent back to my sister, filled with some yummy sweet treats that she can't get in Australia. Of course, a sewer needs sustenance while creating things like this, so I have a little stash of raspberry M & M's to enjoy while making this. 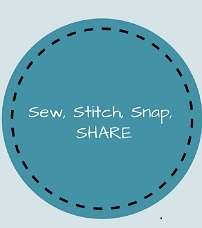 (Thanks Janine) What is your favourite treat to enjoy while sewing? Thanks for joining Linda and I, we love seeing what you have been creating. It has been the most glorious fine weather this weekend, and to top off spending the morning in the garden and mowing lawns, all 30 birds for my Bird Dance project have been finished and sewn together. I have decided not to make the berry border for it,( much to my sister's disgust) because I figure I'll never get it finished otherwise, I am now just waiting on the delivery of some felt for the borders and then I think I will splurge and get it quilted professionally. I have enjoyed making these birds in conjunction with my sister - it has been quite fun to each work on the same project, but know they will be totally different reflecting our own personalities and tastes.I have learnt a lot of new stitches, have developed a love of beautiful threads. and think that there may be an embroidery project somewhere in my future. Now that my bird dance project is just about finished, it is time for my sister Janine and I, to start the felt/embroidery project of my choosing. I debated long and hard whether to do another Sue Spargo project or a Wendy Williams quilt using these materials. 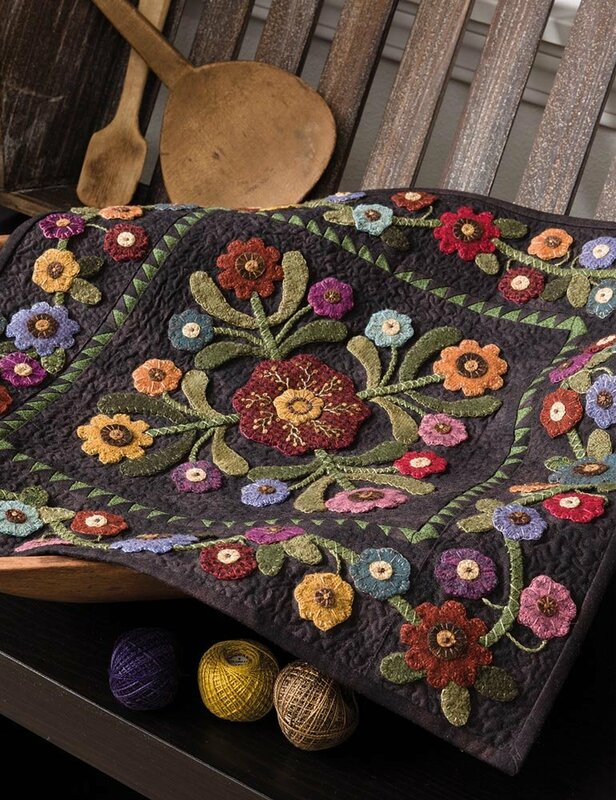 In the end, in what was a fortuitous find, I happened to be looking through a new quilt book at the library one day, when I came across this project for a mini quilt with applique flowers and embroidery. Straight away, I knew that this was my project. While I was in Australia, I presented the pattern to my sister, and we picked the fabric we will use as as our background. Very hard to see in this light, but it is a textured deep inky blue cotton. We may not do the border of tiny half square triangles it requires, but are looking at other options, whether a patterned fabric, or a trim of some description. All that is left now is for me to choose my colour palette, and then I can start this project, with the aim of finishing it by the end of the year. Time to relax with a cuppa and a good book now. Have a great week.